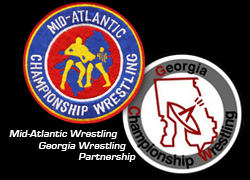 The following is our second in a series of articles spotlighting the talent cross-over between Mid-Atlantic Championship Wrestling and Georgia Championship Wrestling in 1977. In Part One, we discussed a Valentines Night card in Augusta, GA where the Hollywood Blondes (Mid-Atlantic tag team champions Jerry Brown and Buddy Roberts) came to Georgia for one night and challenged Mr. Wrestling I & II for the Georgia tag team championship. Paul Jones was also in for one night to face Gene Anderson in a singles match. If you missed that article, click here to read all about that card, which was taking place at the same time as what we focus on here in Part Two. 1977 would see many stars from the Mid-Atlantic area make one-night appearances in the Georgia territory, primarily in Augusta, GA. 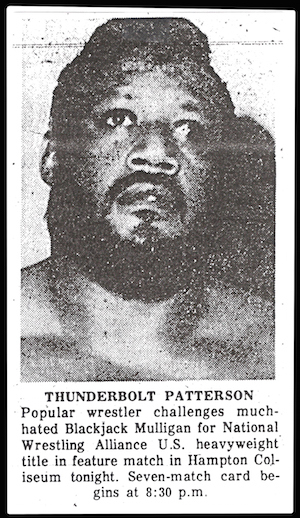 In exchange, one of Georgia's flagship babyfaces Thunderbolt Patterson would make several appearances that year in various cities around the Mid-Atlantic territory. Thunderbolt was no stranger to fans of Jim Crockett Promotions. He had headlined here in the early 1970s, teaming regularly with Jerry Brisco and battling many foes, chief among them the hated Anderson Brothers, who he continued to battle with now in Georgia. Patterson was a huge draw in the Carolinas and Virginia, particularly in 1972-1973. 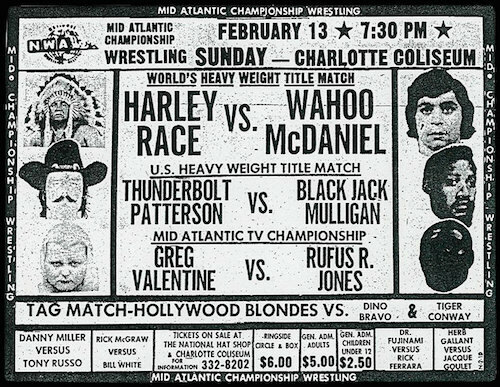 The night before the mixed card in Augusta, Thunderbolt ventured back to the Carolinas for a special return to Charlotte to challenge Blackjack Mulligan for his United States Championship in Charlotte, NC. It was a huge night of action in Charlotte that also saw NWA world heavyweight champion Harley Race defend his title against Wahoo McDaniel. Later that same week, Thunderbolt returned to the Mid-Atlantic territory, this time making a special Thursday night appearance in Winston-Salem, NC. 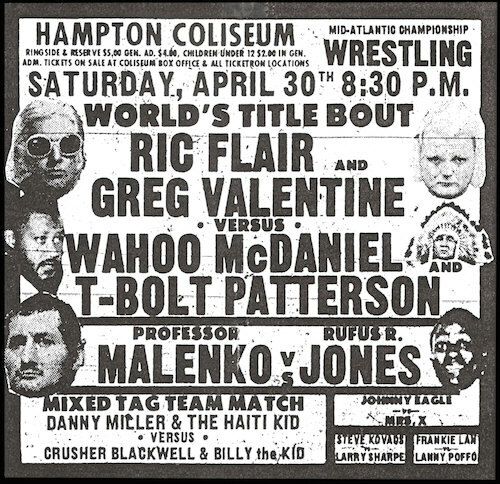 On this night, the number one good-guy in Georgia would team with the number one good-guy in the Mid-Atlantic to challenge the one of the top bad-guy tag teams in the territory - - Thunderbolt Patterson and Wahoo McDaniel vs. the Masked Superstar and Kim Duk managed by Professor Boris Malenko. Thunderbolt would make two more appearances the following month of March, on 3/10 in Savannah, GA and 3/19 in Hampton, VA. On both occasions he would challenge the Blackjack Mulligan once again for the United States championship. Thunderbolt returned to the Mid-Atlantic twice in April, teaming on 4/8 in Charleston, SC, with Johnny Weaver and on 4/30 in Hampton, VA, with Wahoo McDaniel. Both times they challenged Ric Flair and Greg Valentine for their NWA world tag team championships. 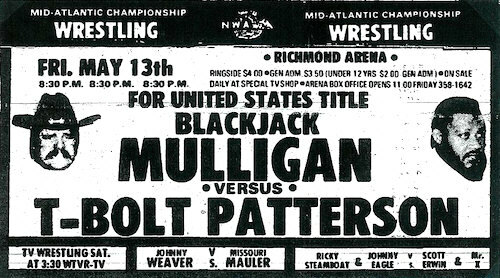 In May, Thunderbolt would make his final two appearances in this four-month series of guest appearances in the Mid-Atlantic territory, appearing on Thursday 5/12 in Norfolk, VA against Ric Flair, and Friday 5/13 in Richmond, VA making one final bid for Blackjack Mulligan's United States title. Coming up in Part Three, we look at the amazing month of May in Augusta GA where several Mid-Atlantic stars made appearances over several weeks, including promotion for a match that gave away the result of a huge main event in Greensboro - - before it actually happened!